We’ve been working with the Environment Agency throughout my time at Essex Wildlife Trust (15 years and counting…) initially within the Essex Biodiversity Project but it’s in the last 3 or 4 years that we’ve really started collaborating on a range of initiatives. Like many organisations we had vaguely heard of the Water Framework Directive (WFD) but didn’t really understand what it meant or the bigger picture. As we became more involved and started to understand the challenges needed to meet the WFD, we could see that what it is trying to achieve aligns perfectly with our broad aspirations for Living Landscapes and Living Seas (Wildlife Trusts initiatives). Consequently we decided that we really wanted to collaborate and so put a lot of staff time and resources into this work, which has really paid off for us. It’s been a steep learning curve over the past few years and some of the deeper mysteries of WFD still leave us scratching our heads, but overall our knowledge and confidence has grown tremendously. The ‘chemistry’ is good – our local EA colleagues have been great to work with, we talk the same language and they want to see tangible results on the ground. It must be a successful partnership when we're all on speed dial and speak on a weekly basis. We have progressed from early projects to map and control invasive non-native species, particularly Floating Pennywort and Himalayan balsam and the mapping of remaining White clawed crayfish populations with translocation to a number of 'Ark' sites (where new populations can be established). When the opportunity to improve a catchment arose we were keen to take this on and work with diverse partners. We also have a major interest in the South Essex catchment with a dedicated project officer (funded for 3 years by the Environment Agency) working to initiate and deliver projects on the Mardyke. Working with colleagues from the Environment Agency led to a successful Catchment Restoration Fund project in north-west Essex (value £420,000). Without their input we would not have been able to submit such a strong application. This project will be concluded in September 2015 and has led to further projects under the Catchment Partnership Action Fund (CPAF) on the River Chelmer and on the Mardyke and the River Ingrebourne. 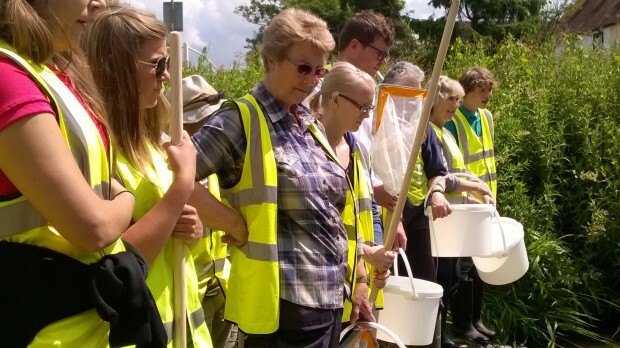 When we started looking together at issues within the catchment we realised that there was a lack of information available to us so with colleagues in the Environment Agency, we designed a river walkover survey that, with a little training, could be undertaken by volunteers. Initially as a staff team we mapped over 75km of river corridor locating and photographing every feature. This walkover data is available on the Essex Rivers Hub website. The network of volunteer river wardens (140 to date and growing) now undertake this survey work on sections of river not previously covered. Through our work together I have had the opportunity of meeting with senior Environment Agency and Defra staff and had the chance to share what we’ve been doing and our perspective as a delivery organisation and it's gratifying they’re genuinely interested to hear it. We are very grateful to our friends within the Environment Agency for all their support and help over these past years. I think we can be proud of what we’ve achieved together and within the wider catchment partnership. Mark Iley has been the biodiversity co-ordinator for the Essex Biodiversity Project since 2008. The project is an informal partnership of around 40 organisations working to preserve and enhance Essex biodiversity. 'Animal Farming' alone uses 45% of our planet's land and it is the primary cause for green house gases, global warming, depletion of food resources, destruction of habitats and extinction of multiple species. Animal Farming uses a major portion of cultivated grains to feed animals. The amount of water used to cultivate grains is a staggering portion. If we consume less meat or better still if we all become vegetarians or vegans, all that cultivated grain can be used to feed humans, instead of animals and we wouldn't be facing hunger, global warming and extinction of species at the scale we are facing today. Would you consider this?